Favorite was the red velvet…I’m a sucker for red velvet and cream cheese frosting. It was an absolutely beautiful summer day on Wednesday. I met up with two college friends in Madison Square Park to mark my second visit to Shake Shack. On my previous visit I ordered a Shack Burger, so this time around, I got a Shroom Burger (have I mentioned I love portobella mushroom burgers?). The Shack Burger consists of Black Angus beef with American cheese, lettuce, tomato, and Shack Sauce. 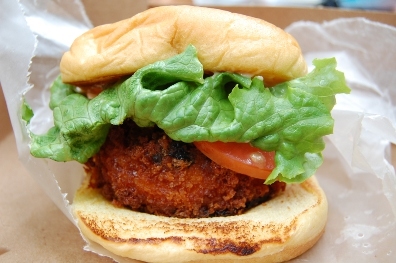 The Shroom Burger consists of a crisp fried portobella, filled with muenster and cheddar, and topped with lettuce, tomato, and Shack Sauce. It’s a shame that I have never tried their shakes, custards, or concretes yet. I’m just never THAT hungry… Hopefully one day..